A misty dawn on the mountains. A bronze sunset across the expanse of the Brahmaputra. The clang of prayer bells at a monastery. Life moves at a serene pace in the North East. The North East is composed of seven states whose natural beauty has earned them the sobriquet of 'seven sisters'. The entire North East India is a land of great natural beauty and variety. Framing these fertile valleys of the rivers Ganga and Brahmaputra is the Himalayan chain in the north, Arakans in the east and the Khasi and Garo hills of Meghalaya, in the south, the region is rich in flora and fauna. The region is also home of the famed Royal Bengal tiger, one horned rhino and troy antlered deer. North East is the home of great cultural traditions. A large number of very colorful tribes with interesting customs and traditions live here. Shillong, known as the Queen of the East is really a perfect getaway. Sikkim is a snow clad mountainous region which is a botanists dream. The mighty Kanchenjunga is the presiding deity of the region. Kaziranga the homeland of the one horned Rhinos, Elephants and many other endangered species is internationally famous. 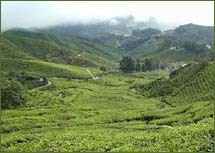 Darjeeling is the tea center of the world. The highlights if expressed in short are: Natural Scenic Beauty, Cool Climates, Water Bodies like Rivers and Lakes, Buddhist Monasteries, Ethnic Cultures, Tea Tourism, Historic Places, Archaeological Remains, Water Sports, Golf, Polo, Martial Arts, Indigenous Games, Fairs and Festivals, Flora and Fauna, Wildlife, Eco- Tourism, Mountain & Adventure Activities, Nostalgia Tours, Handloom Textiles & Handicrafts, Shopping, Distinctive Cuisine, Angling, Mountain Flights. These states together have indeed so much to offer to travellers with different kinds of interests. hotels or Similar in base category rooms. Daily buffet/fixed breakfast in Superior , Deluxe & Standard Package. After breakfast go for a half day sightseeing tour covering The Rimbi Water Falls, Rimbi Rock Garden , Kanchandzonga waterfalls , Khechepadi wishing Lake , 2nd half surface transfer to Gangtok , Overnight stay at hotel.